Identification. The British named the two islands after the naval officer Viscount Falkland. Location and Geography. 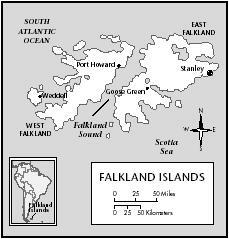 The Falklands, located approximately 185 miles (480 kilometers) east of Argentina, consist of two main islands, East Falkland and West Falkland, and over two hundred smaller islets. The combined area is 4,700 square miles (12,170 square kilometers). The terrain is mainly hilly to mountainous grassland. Shrubs abound, but there are no native trees. An impressive diversity of animal life includes elephant seals, sea lions, penguins, and other birds. Demography. As of the year 2000, there was a population of 2,826 permanent residents, of whom 1,750 lived in the capital, Stanley. The majority are of British descent, although there are a few immigrants from South America, Chile in particular. At any given time, there are about two thousand British military personnel. Linguistic Affiliation. English is both the official language and the language of daily life. Symbolism. The coat of arms, which appears on the flag, contains a representation of the sailing ship Desire, which was the first to reach the islands, and a white ram symbolizing shepherding, the industry on which the economy was built. Emergence of the Nation. It is thought that Patagonian Indians may have reached the islands by canoe, but when the Europeans encountered the islands in the seventeenth century, they were uninhabited. The British landed in 1690 and claimed the islands. The first settlement was by the French, at Port Louis on East Falkland in 1764. Spain soon after pressured the French to leave, and in 1767, forced the British out of a settlement on West Falkland. Argentina claimed the islands in the late 1820s, and the British reclaimed them in 1833. In the late 1800s, sheep ranching brought some wealth, and the British declared the islands a colony in 1892. Although the Argentinian were forced out in 1833, they did not abandon their claim. In the late 1960s, Britain began to make moves to hand over the colony to Argentina. However, the process was slow, and in 1982, Argentina's government staged an invasion. Britain sent troops to retake the islands. The ensuing war took nearly one thousand lives (three-quarters of them Argentinian), and after seventy-two days, Argentina surrendered and its president resigned. Argentina's government holds to the conviction that it will retake the Falklands, although it declines to use military force to back up its claim. National Identity. There is no indigenous culture; the population is entirely imported and mainly British. Despite historical ties to Argentina, most inhabitants align themselves with Britain. Since the war in 1972, they have been developing a relationship with Chile. There is a low population density, with the majority of people living on farms and ranches in rural settings. Stanley is the only urban center. Its architecture is British in character. breakfasts" are popular, especially in rural areas. Seafood is an important part of the diet. Basic Economy. The currency is the Falkland Island pound. There is no unemployment, but much of the work is seasonal, such as peat cutting and sheep shearing, and many islanders supplement their incomes with small-scale mechanical and agricultural projects. Commercial Activities. The main goods produced are agricultural. In addition to sheep products (wool, hides, and meat), the islands grow vegetables such as potatoes, cabbages, and cauliflower. Major Industries. Until recently, sheep shearing and wool processing was the major industry. This business was incorporated in the Falkland Islands Company in 1851, included in the British Royal Charter. The fishing industry has grown rapidly as a result of the government's declaration of the Falkland Islands Interim Conservation and Management Zone (FICZ). Between 1985 and 1987, gross national product tripled. Trade. The primary products produced for export are wool, hides, and meat. The main imports are food, drink, building materials, and clothing. The major trading partners are the United Kingdom, the Netherlands, and Japan. 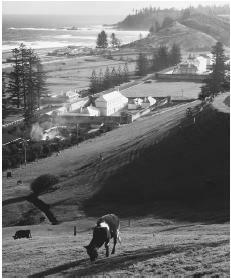 Farms on coastal hills, Kingston, Norfolk Island. Agricultural products, such as wool, meat, and vegetables are the foundation of the country's economy. Government. The Falklands are governed as a colony of the United Kingdom. The highest political official is the governor, who is appointed to represent the British monarchy. Along with an Executive Council of six, the governor is responsible for administration. The Legislative Council is composed of two ex-officio and eight elected members. There is universal suffrage. There is a Supreme Court, the chief justice of which is a nonresident. Leadership and Political Officials. There are not any political parties; all officials run as independents. Military Activity. Roughly half the population consists of British personnel; two thousand troops are stationed at the Mount Pleasant airport complex. 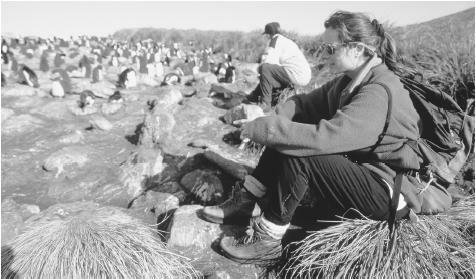 Visitors watch a colony of rockhopping penguins. The Falklands ecosystem includes a wide range of wildlife, including penguins, sea lions, and elephant seals. farms in rural areas. Students who do not attend these schools are home-schooled with the aid of traveling teachers and radio and telephone lessons. Higher Education. There are not any institutes of higher learning, but citizens are eligible to receive funding for vocational and higher education classes in Great Britain. Religious Beliefs. The vast majority of the population is Anglican. The King Edward VII Hospital in Stanley is the only hospital. It was destroyed by a fire in 1984 and rebuilt in 1987. The care provided is free and comprehensive, with the exception of eyeglasses, dentures, and cosmetic dentistry. Annual sports meetings take place in Stanley on 26 and 27 December; on West Falkland they are held in late February or early March. They include horse racing, bull riding, and sheepdog trials. Also observed are the Queen's Birthday (21 April), Liberation Day (14 June), Falklands Day (14 August), and the Battle of the Falklands Remembrance Day (8 December). U.S. State Department, Central Intelligence Agency. Falkland Islands, 2000. Falkland Islands Government on the World Wide Web, www.falklands.gov.fk . Reading this forum brought back memories of when the Hospital burnt down , a sad day in Port stanley. Thank you for your information. They help me a lot to do project. I am a S1 student in Hong Kong. this site was great. If ever i procrastinate on a project i'm coming back here.thanks! i live in maryland and we are under EST. is there a difference in the time zone in the falkland island? if is is 10 pm. EST here what is the time there? Thanks, this information helped me a lot, but it would be more useful if you added a list of Famous Native Falklanders. Thanks for your patients, and time. Comments, Questions or Concerns don't hesitate to do so. Do the Yaghan people live on Falkland Island? It says that Falkland Island has been developing with Chile But i still do not know if the Yaghan people from Chile are living there. If you could please find some info and get back to me as soon asap. Hi. My exploring cultures class is doing a project on S. America and I was assigned the Falkland Islands. I honestly didn't know a lot about them but this info really helped. I have to create a visual and I wanted to do something along the lines of traditional wear. I was wondering what they wear or used to wear. I know their wear probably descended from Britain, but I still would like to know anything possibly unique to the islands. Thanks! This really helped with my Falklands research project.